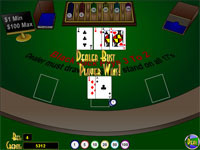 Black Jack is a game where the player attempts to get as close to 21 as possible without going over. At the same time, the dealer attempts to get as close as possible to 21 without going over. If the player busts (goes over 21) the dealer wins, even if the dealer busts. If the dealer busts, the player wins provided he did not bust first. 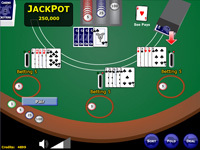 The games starts when the dealer deals two cards to the player and two cards to himself (one up and one down). 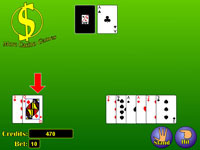 At this point if the player has two cards of the same rank, he may choose to "split" his hand into two hands. He may chose to "Double Down" which will double his bet, and he will receive one additional card. He may also choose to hit, which will give him additional card. The player will continue to hit until he either busts, or chooses to stand. The dealer will then hit until he busts, or his hand totals 17, at which point the dealer will stand. Face cards (Jack, Queen, King) have a value of 10. Ace has a value of 1, or 11 depending on whether a value of 11 would cause the player or dealer to bust. Split - A player may split his hand if he has two cards of the same rank (i.e. Ace of Hearts and Ace of Spades). 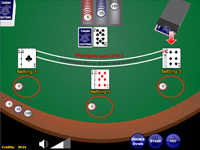 Double Down - A player may double down when he has been dealt his first two cards. Doubling down doubles the players bet, and he is dealt one and only one more card. 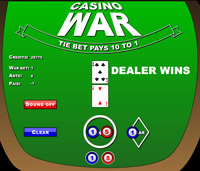 Hit - A player may hit, and the dealer will deal the player an additional card. A player may continue to hit until he busts, or chooses to stand. Stand - When a player stands, he will no longer be dealt any additional cards for that hand.